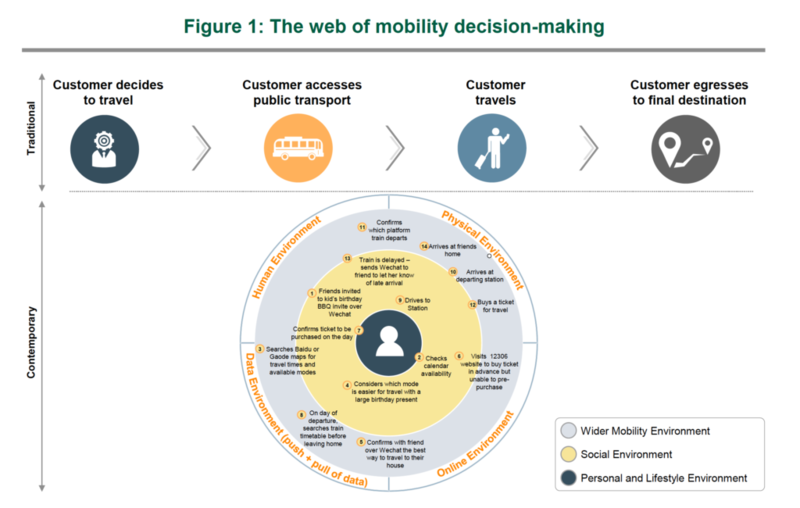 Mobility-as-a-Service (MaaS) has the potential to revolutionise the way society thinks about travel. The Chinese Government is just now starting to understand all the benefits that come about from a more unified transportation ecosystem. Despite the obvious benefits, there are still some hurdles to adopting this new infrastructure. In this article, Mark Streeting, Helen Chen, Yong Teng, Emma Edgar and Justin Koh from L.E.K. Consulting, dive into the details of transportation connectivity. Sparked by the rise of ride-sharing services, electric cars and eventually autonomous vehicles, the transportation ecosystem is increasingly looking like a complex web that will merge transportation services and infrastructure with mobile technology and big data (Figure 1). This complex web, called MaaS has brought together transportation businesses, and the services they provide, by using applications (apps) that do a variety of things. Using MaaS could mean ordering a taxi or rideshare to the airport, arranging air travel, purchasing a train ticket, and even booking a hotel through a series of mobile apps. Less often thought about, but just as important, is the opportunity for governments to work with private transportation providers to create or foster MaaS platforms. These platforms can be used to increase the use, productivity and efficiency of public and private forms of transportation by coordinating and integrating multiple modes of travel. As traffic congestion worsens, the current use of private cars for door-to-door journeys is looking to be an unsustainable solution, especially when one takes into account cost, travel time and other related factors. However, MaaS could help reverse this trend. This new transportation platform will eventually be able to predict demand, suggesting the right service at the right time to consumers while giving providers the opportunity to plan ahead and meet customer demand. This new transportation concept puts the customer experience first by increasing convenience, effectiveness and customer satisfaction. It also enables people to share and personalise their travel experiences through real-time connectivity. Information on provided services for bicycle hires, ridesharing, carsharing, road tolling and public transportation can be brought together under one user account and paid for with a single tap to a mobile device’s screen. This requires a real-time exchange of information between the consumer and transportation service provider. If successful, it allows for a customer’s needs, preferences and willingness to pay to be more appropriately matched to a relevant service provider. • increased regional responsiveness to the emergence of new transportation services. 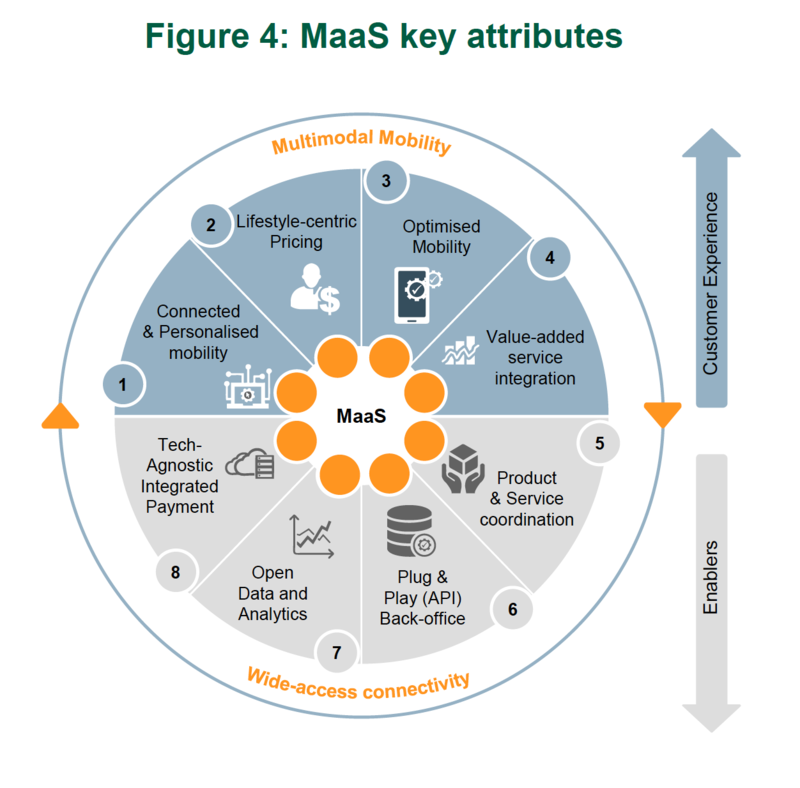 The MaaS delivery model has eight key attributes (Figure 4). Half are related to the customer experience and the other half to enabling technologies and processes. These attributes have a variety of different functions; take for example pricing under MaaS. Pricing could start with a stand-alone pricing structure and evolve into something that is more integrated with customer lifestyle choices and is subscription based (Figure 5). In an environment where MaaS is possible, traditional ways of thinking about transportation infrastructure (e.g. car, bus or train), is no longer be considered best practice. Planning needs to evolve and embrace the possibility of delivering an integrated solution that addresses what the modern consumer needs and expects from transportation. When is MaaS coming to China? The commercial development of MaaS encompasses both single-mode and multimodal journeys; value- added services; innovative products and pricing models; and real-time, on-demand service planning. The problems with current MaaS offerings in China is the lack of an integrated payment system and the absence of door-to-door planning for multimodal journeys. Government participation in the MaaS ecosystem will be key to overcoming these limitations. 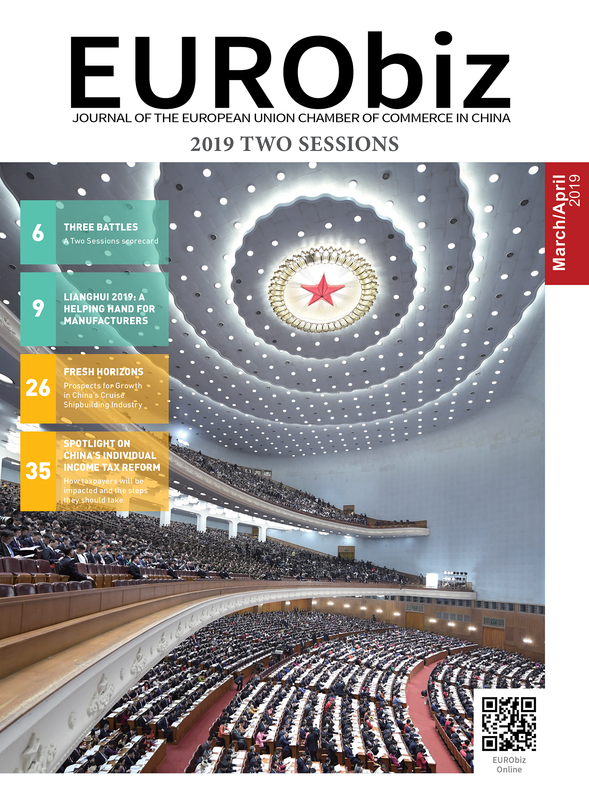 To date, Chinese regional public transportation authorities have not overtly participated in commercial MaaS offerings, although public transportation service data has been recently used in commercial mobility journey-planning platforms, such as Baidu maps. While some suspect that MaaS is a fad, big businesses have invested heavily in mobility and have procured the apps necessary for making it happen. Companies have already presented business models that contain groundbreaking product offerings that have gone on to influence consumer decision-making and expectations. On the one hand, personalised on-demand travel services such as ride- and car-sharing could cut into public transportation’s market share and reduce its ability to recoup operating costs from collecting ride fares. On the other hand, this disruption to the market could present an opportunity to find new markets for various modes of transportation, improve cost-efficiency, reduce people’s reliance on private vehicle ownership, decrease road congestion and increase public transportation use. So far, transportation authorities have approached the evolution of transportation in a piecemeal way by creating apps that facilitate the use of public transportation (e.g. journey-planning apps) or developing innovative but standalone payment systems. Creating an open and standardised platform to bring transportation suppliers together in one marketplace allows customers to access mobility in a way that is more streamlined and unified. International MaaS success stories such as Helsinki and Turku in Finland (Figure 6) demonstrate that a frictionless experience, strong branding and customer trust are crucial aspects of MaaS delivery. Providing end-to-end mobility for customers requires the involvement of infrastructure providers, all levels of government, and businesses. It also requires a system-wide perspective that improves transportation ecosystems and benefits customers both socially and economically. To promote public and private opportunities, governments should consider what industry incentives can be offered to support the ongoing development of MaaS. Having MaaS represents a significant opportunity for all participants in the mobility ecosystem. 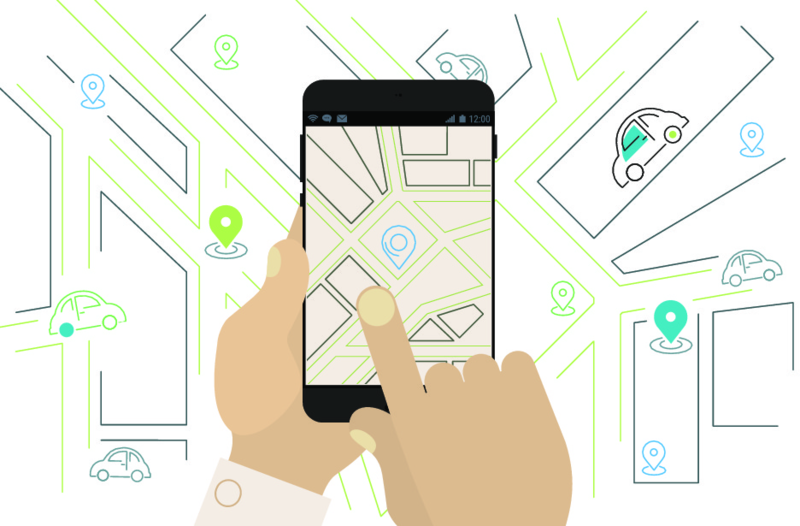 Mobility suppliers will benefit from MaaS by using it to identify new market opportunities, hone their service offerings and optimise their spending. Governments will also benefit. The data platforms underpinning MaaS can be leveraged for city planning, to keep people moving efficiently and avoid building expensive and unnecessary infrastructure by improving the utilisation of existing assets. To maximise the benefits that MaaS could deliver within the next decade, both businesses and governments would do well to begin thinking about, and acting towards, creating a single platform that offers consumers one-touch access to journeys that can span all the way from their front door to the skies and shores of distant lands. L.E.K. Consulting is a world leading management consulting firm founded in Europe in 1983 and started doing business in China in 1998. L.E.K. Consulting now has 20 offices in Europe, the United States, Asia and Australia, with over 1,200 employees and over 100 partners. Share the post "Mobility as a Service"